Everyone and their dog seems to be trying to get into the social Web, but Tonium, the folks who built the pricey but slick-looking Pacemaker mobile DJ player, have an interesting take. They’re combining mobile hardware, mixing and media management and software, and social site in one integrated service. It’s a bit like iTunes, Beatport, iPod, and Traktor had a love child. 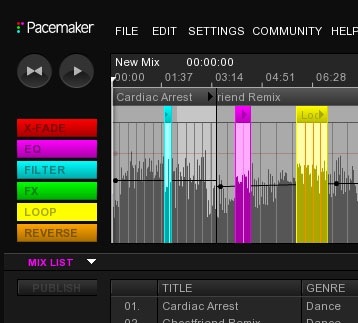 The idea is a three-pronged approach: there’s the portable DJ MP3 player we’ve seen before, for storing your music library and mixing sets on the fly, editor software that lets you fine-tune mixes, and a web community that lets you share mixes with other Pacemaker users. The editor syncs with the hardware, mixes from the hardware and the software can go online — you get the idea. All of this looks good — and literally looks good, with lots of shiny black business on the website — but the question remains whether anyone can be taken seriously DJing this way, or perhaps whether that matters. The target seems to be casual listeners wanting a slightly more interactive experience, and people with some cash to spare. The software is already interesting, but time stretch and more customized effects are still due in an update. I also wonder if some people will just forgo the hardware and use the web tool and software.